Whew, this has been a super busy month already. After the week in San Francisco, I had to make a mostly unplanned trip to Arizona to deal with some family matters. I will leave this off as my mother’s increasing dementia making me feel trapped in an episode of “Hoarders” and really overwhelmed for a bit. But, on a brighter note, I did get my giant Opus tile finished, as Gridiculous as it is. (Gridiculous is the name Jenni Perruzzi has given her Zencil system to line out Opus-sized tiles. You can find this on etsy.) I had a few openings still left when this week’s Diva Challenge (#234) was issued, for a UMT (Use My Tangle) by Chris Titus for her tangle CanT. 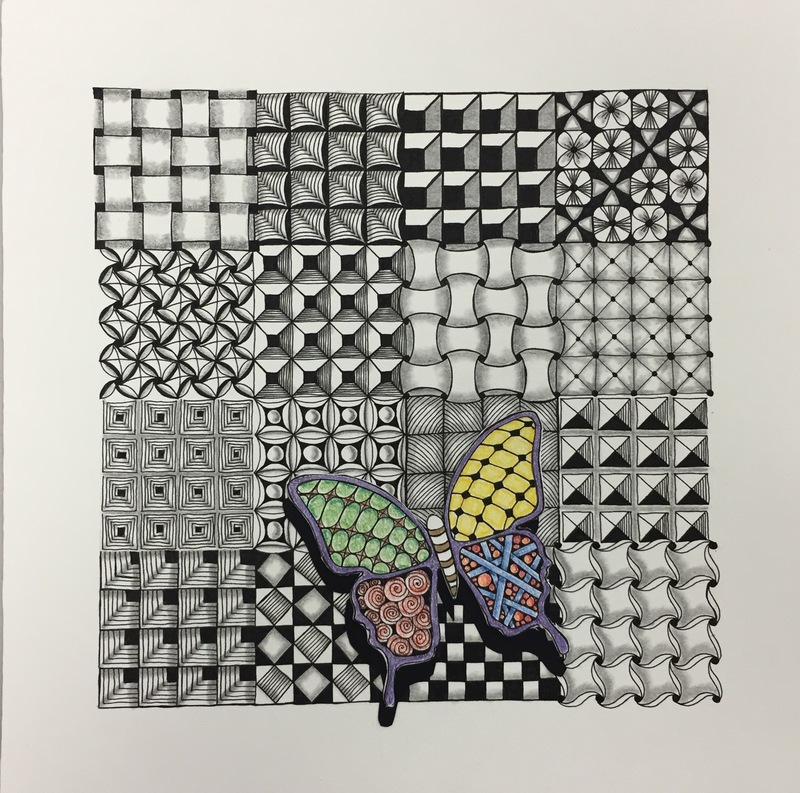 Of course, I felt the need to include it on my all grid based tangle project, and kill 2 birds with one stone! Of course, Opus is a larger tile, so this took a while. If you want to do one of your own, I will be teaching this as a class on September 26th. Oh, and I fixed the glitch in my etsy store. I finally got the postage issues straightened out, and the ordering works fine now. ‹ PreviousAnd the Week Just Flies By! Ooooh that’s pretty! Love the splash of color with the shadow, (butter)flying over the tile! That is actually 2 cut outs layered on the Opus. Looks too cool! I do like your tile and the butterfly is great in it. I will do what you asked in you mail in the weekend, I’m quite busy at the moment (who had thought so, being busy after retiring). Would you believe I am retired, too? And so busy! Your grid is very beautiful ! I love that Opus. Guess what I’m going to be doing this weekend? Actually, everything here is just lovely, your work is beautifully executed. Glad to add to anyone’s addiction anytime! Beware, that took me a couple of days working on it a few grids at a time. Well, I’m being cautious and doing it in 3×3, each square and just doing 9 squares, not 16. If it looks OK, I might do a bigger one. Maybe. I love your Gridiculous with the butterfly! 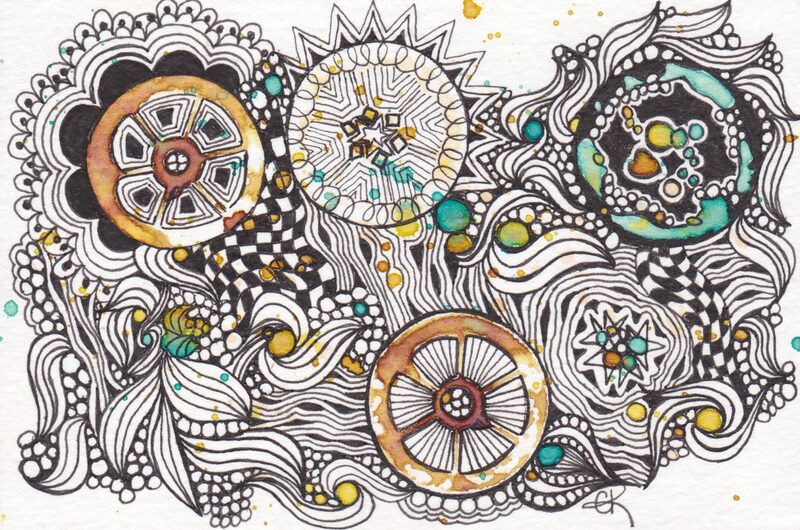 This is the Zentangle version of an old time framed sampler. What a great idea, and your tangles in it are so beautiful! Hope you get some time to settle down and relax a bit before your next jaunt. What is with the Canadian tanglers? They are the most fun group ever! Have an excellent time in Canada! I think the Canadians like to party!